SnapCash Binary trading software by Austin Ford is said to be an auto-trader that generates more than $1200 profits per day, but don’t be fooled. SnapCash Binary is a scam, just like many other generic trading software out there. I’ve had readers who lost $500 deposit within a day, so make sure you read this review if you are still considering to fund your account. SnapCash Binary is a fraud that hires actors to promote the scam. 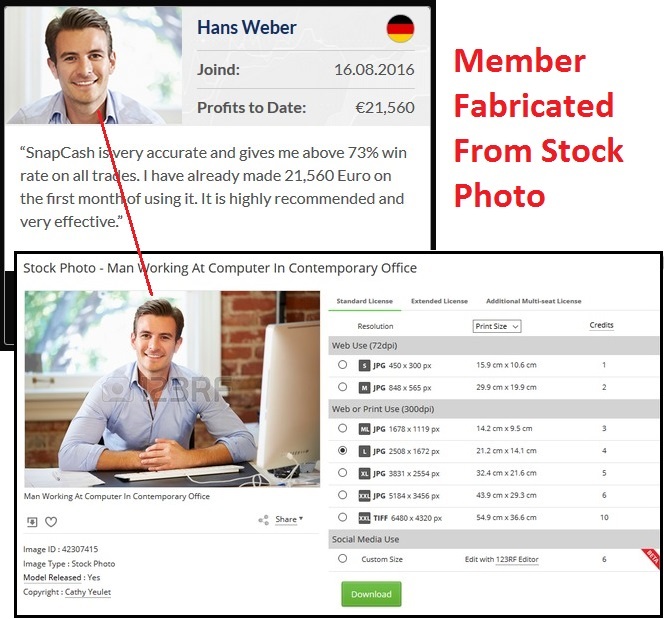 Their member profiles and reported profits are found to be fabricated. The truth is well hidden in the disclaimer that escapes the eyes of most victims. The alleged owner of SnapCash Binary software, Austin Ford claims to have developed a full-fledged money making software through self-taught coding. His software is said to generate more profits in a week than most people make in a year. 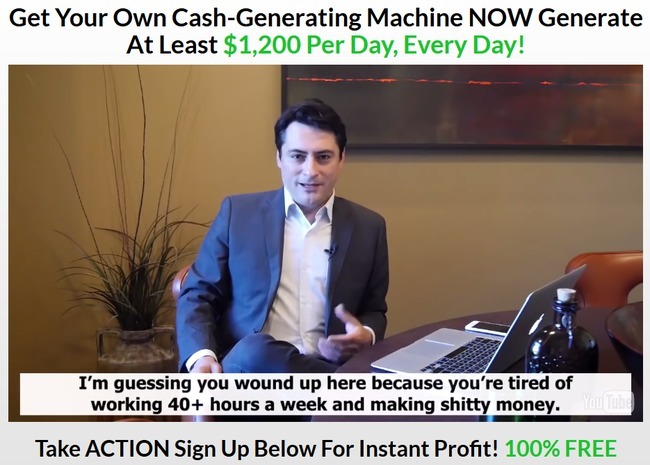 Specifically, he promises to make you over $1200 daily profits. To prove his claims, he offered to open free trading accounts for 2 strangers on the street and film it into his sales video. I have something to reveal about these “strangers”, but first let me show you an email from one of my readers. Once auto-trading is activated, the software can generate trades for you automatically. It can cost you dearly if you leave it unsupervised for a couple of hours. Unfortunately, you can’t retrieve lost funds because it’s lost in trading. You can only hope to withdraw what’s left of your deposit from the broker. Some of you may have questioned the authenticity of the sales video, but there are victims who took it seriously and believed every words of Austin Ford. However, as much as the fraudsters want to keep you in the dark, they have to reveal the true nature of the sales video somewhere in the website. This is to protect themselves from legal actions. To clear up all doubts, I’m referencing to the disclaimer document in their own website, which is linked via a very small fine print at the bottom of their sales page. You won’t find the document anywhere in the sales material, because it is supposed to be hidden from you. You can authenticate the terms quoted above with this link: snapcashbinary.com/disclaimer. The snapcashbinary.com sales video is fictitious and was produced to portray the potential of snapcashbinary.com 3rd party signals software. This evidence alone is sufficient to prove that SnapCash Binary is a scam. It is designed to mislead you into thinking that there is easy cash to be made online. If the scammers really wanted to warn you, why don’t they come clean in the sales material? The risk disclaimer is clearly just a legal tool, designed to let scammers escape from the blatant lies they have told in the sales video. While there are indeed money to be made from the internet, it doesn’t come from push-button software like SnapCash Binary. You have to learn the proper way to set up your online business. I have some readers who asked if the profits made by the featured members are real, so I’ve added this section for clarification. As you can see above, the “member” of SnapCash Binary, Hans Weber is said to have made €21,560 on the first month of using the system. I’ve made a reverse look up of his profile picture, and it landed me at a stock photo vendor website called 123rf.com (screenshot above). Stock photos are basically royalty-free images that can be bought by anyone for advertising purposes. The description of this photo is generic – it’s a stock photo that depicts a man working at computer in contemporary office. This man is not Hans Weber, and most certainly he has not made huge profits with the software. He’s just a fake member fabricated by the scammers behind SnapCash Binary, in order to deceive their victims. Fabricating fake members is an old trick in online scams. It has been used in multiple other scams that I have reviewed earlier, including Polygraph Millionaire and Private Profits Club. If you decide to sign up for SnapCash Binary app, you will be required to open a new broker account with their partner brokers, which are unregulated by monetary authorities. The losses are pocketed by the broker, which is then shared with its partner-in-crime – the scammers behind SnapCash Binary system. SNAPCASH BINARY IS A SCAM. I strongly advise you to stay away from the scam if you don’t want to lose your hard-earned money. I’ve deposited $250 into it but I didn’t start auto-trading. Can I withdraw my fund? Hi Catherine you can still withdraw your fund. Just don’t accept any trading bonus or you may have difficulty withdrawing.